The 2017 Masters tournament will be BIGGER than ever now that FanDuel has also started offering fantasy golf games and they have come out with their own BIG contest for The Masters. Fantasy Golf continues to grow and Masters Fantasy Golf Contests have continued to grow too! Listed below are the fantasy golf sites that are running a 2017 Masters Fantasy Golf Contest and their most popular contest run this week. Each fantasy golf site will also have smaller games to play and even some have FREE Fantasy Golf contests for the Masters Tournament so we suggest hyou check them all out and see where you can make the most money. Click the banners for details of all the 2017 Masters contests below and decide which ones you should play in. Keep in mind, some of the smaller fantasy golf sites like FantasyDraft may have overlays so you may want to join the site and take advantage of the overlays. 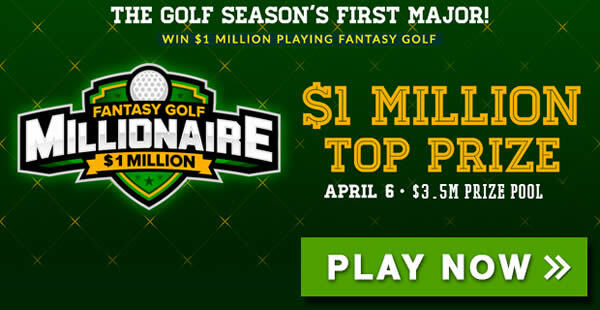 Always the biggest fantasy golf contest for the 2017 Masters, fantasy golf players get a chance to win a 1st place prize of $1 Million for just a $33. You can make multiple entries and dropping a couple of hundred bucks can really pay off if you have some fantasy golf skills. If you are going to play in just one Masters Fantasy Golf contest in 2017...May as well be the BIGGEST One! Update - There are now details on a FREE Fantasy Golf Contest for the 2017 Masters as well - Click the graphic below for access to the FREE Fantasy Contest for this week only! Not as big as the contest above but $750,000 with 1st place cashing in $100K is still some serious money for fantasy golf for the 2017 Masters Tournament. The FanDuel Golden Eagle Contest has a grand prize of $750,000 and the best part is that it only costs $4 to enter! With such a low entry fee you can put in a bunch of different lineups and improve your odds of cashing in. Nice first Fantasy Golf Contest for the 2017 Masters Tournament by FanDuel. FantasyDraft.com is having a $20,000 Masters Golf Contest for 2017. $25 gets you a shot at a 1st place prize of $20,000. If you don't want to compete in one of the really big contests above that will fill up, this one is a great contest to play in. They also have a free contest (no prize money, just for fun) if you want to try out the fantasy golf games at FantasyDraft. Do you want some help making expert picks for your fantasy golf lineups? We have two sites to try out. The guys at Golfbanket have been on fire in 2017 so their Expert Golf Picks for the Masters should be worth the investment. They have a money back guarantee so why not take advantage here - GolfBanker.com. The other site to try out is Golfstats.com. They offer awesome research tools for you to figure out the top picks for the Masters but they also offer up their Masters Fantasy Golf Picks too! They are like a one stop shop for fantasy golf players. Check them out if you want an edge over the competition.